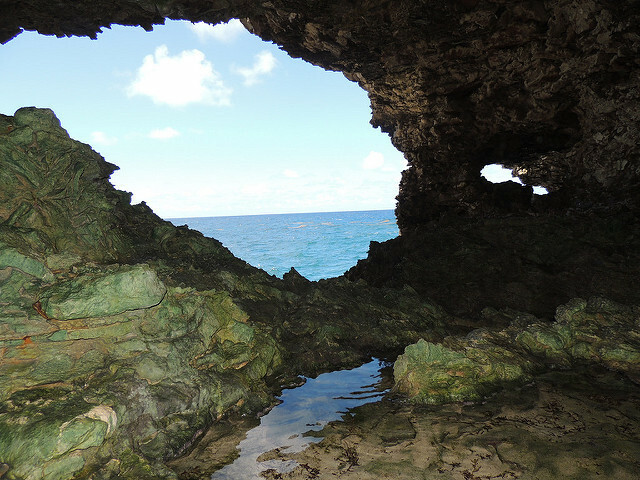 The Animal Flower Cave is located under the cliffs at North Point, St Lucy and is the island’s lone accessible sea cave. It was actually discovered by its seaward entrance in 1780 by two English explorers. Coral steps lead down through an opening into the cave. Here you will see several openings looking out to sea, offering spectacular views, as well as several pools, some of which are deep enough to swim in. The name “Animal Flower Cave” comes from the sea anemones found in the pools. The flower’s tentacles retract if you touch them. The walls of the cave are full of interesting formations which have been coloured green and brown by oxidation of copper and iron. The restaurant has become a popular destination among both locals and visitors. Serving lunch every day, with daily specials, the dramatic cliff top location is breathtaking, with the crashing waves of the Atlantic ocean below. At certain times of the year, and in bad weather, the caverns become filled with water and the entrance acts like a giant blowhole. During the season you can spot whales playing in the ocean.